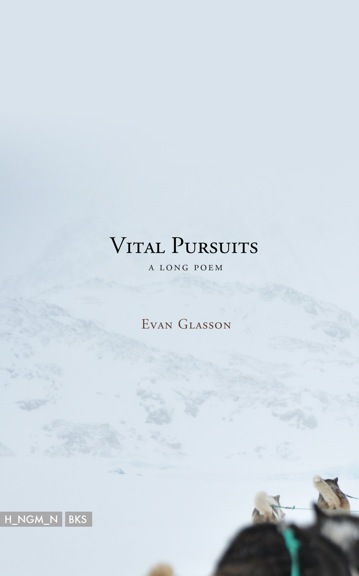 Vital Pursuits was a book of poems I bought randomly at the last AWP book fair, and it was one of my favorite surprises of the year. What I like so much about it is how it proves that you can have a formally inventive book that also makes you feel something. The poems are enjoyable just on the level of language, but they also don’t shy away from narrative, character, or situation. The book is a long poem, and in choosing the long poem form, Glasson avoids the tiresome conventions of endings. Instead the book reads like a series of interesting middles of poems connected by theme and creating a larger whole. The poems drift from trope to trope, exploring angles briefly, wearing lenses, but then moving restlessly on to other tropes and lenses. But the impulse doesn’t strike one as artifice. Instead it rings of genuineness and emotional vulnerability. The tropes are necessary in coming to terms with experience, not conceptual games played for their own sake. One of the most pleasurable aspects of the book is on the level of the line. Glasson has a real knack for creating surprise in his line breaks and writing lines that stand alone as poetic units. It is a lovely reminder that the line is the most basic element of poetry and that a good poem has an obligation to surprise us with every line. I could open to almost any page for an example. Here is pg. 38.
how little the lovers need say. Sometimes it’s more about being there. where it is. To leave it alone. there and another for not so/ far there. […]. Rarely was there a line in the book where I felt something interesting didn’t happen, and in many other books of poetry that I bought randomly this year, I would be hard pressed to find anything interesting that happened at all. I highly recommend this book as one of my favorite discoveries of 2012.